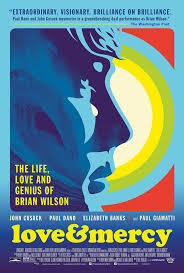 “Love and Mercy” is a compassionate, gripping and touching tale of the Beach Boys rise to fame and the man (Brian Wilson) behind their distinctive sound. The film’s a refreshingly unconventional biopic directed by Bill Pohlad, which explores the mental world and the artistic method of a musical genius. Paul Dano plays Wilson in the 60s and John Cusack in the 80s; both actors nail their performances’. Dano captures Wilson’s boyish enthusiasm in the studio and the beginnings of his mental breakdown. Cusack’s role is that of a broken man forced into childlike behavior under the care of a dangerous and unconventional psychologist Eugene Landy (Paul Giamatti). Elizabeth Banks (Melinda Ledbetter) is the hero of the film who’s determined to save Wilson despite the costs. If anything, the film is a loving tribute to the Beach Boys giving us insight into the bizarre details of the groups’ struggles and triumphs.